I like it when a director shows favouritism towards working with certain individuals. I really believe it brings the best out of the actors. Perhaps one of the most notorious directors for this is Quentin Tarantino, who makes no great secret of the fact that he favours using Samuel L. Jackson at every opportunity, as well as Uma Thurman and Christoph Waltz when the opportunities arise. Another pairing that’s recently come to light is Neil Blomkamp and Sharlto Copley who will soon embark on their third outing together. 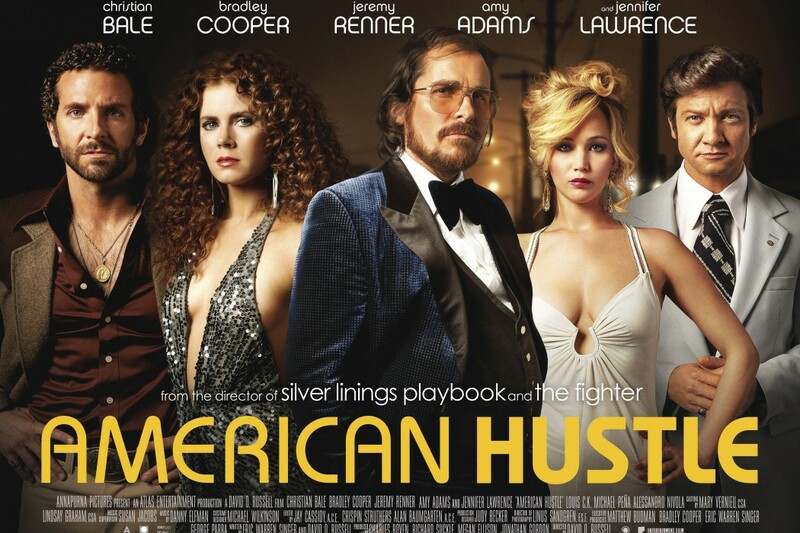 So, when I saw the billing for David O. Russell‘s American Hustle, I won’t lie; I was excited. He’s seemingly done a great job of welding together the casts of The Fighter and Silver Linings Playbook to deliver his latest outing. How does Russell‘s Frankenstein’s Monster turn out though? The cast of American Hustle is like a glorious chef’s recipe: 2 parts The Fighter (Christian Bale and Amy Adams), stirred with 2 parts Silver Linings Playbook (Bradley Cooper and Jennifer Lawrence), folded in with new turns from Jeremy Renner and a host of others. What’s delivered? A delicious slice of 1970’s Americana revolving around blagging, conning and a whole host of escalating events. To break it down, Irving (Christian Bale) is a con-artist – small time – but a con-artist all the same. He takes this up a notch when he falls for Sydney (Amy Adams), who completes his criminal duo perfectly. The first problem? Sydney isn’t his wife. Rosalyn (Jennifer Lawrence) is his wife. The second problem? Well, don’t try and con an undercover FBI agent, Richie DiMaso (Bradley Cooper), as you’ll get enveloped into working with one wild agent. And third? Don’t make friends with your next con; especially when he’s the Mayor (Jeremy Renner)… Believe me, there are numerous other problems for our cast, but that would be spoiling things somewhat! The strength of American Hustle is clearly in its cast, but the same too can be said of its plotting. But let’s first dwell on the performances. 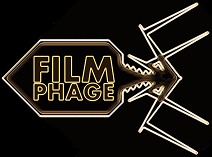 It’s no secret that The Phage is a huge fan of Bradley Cooper. We tell you this every time we see him in a film, and indeed, tell you at numerous other times too. Cooper is again on sterling form, with a role that’s got more in common with The Place Beyond The Pines more than his “typical” Hangover-esque portrayals. In fact, I’m not sure it’s even fair to use The Hangover roles to describe Cooper any more; he’s done far too many other films. Similarly, Christian Bale is on great form too, clearly relishing the role. Likewise, Amy Adams and Jennifer Lawrence deliver solidly in their performances. I’m a little surprised to see Lawrence up for BAFTAs and Globes with her performance here, which isn’t as captivating as that of Silver Linings Playbook, but that’s mainly because she’s not strictly a main character here. I was pleasantly taken aback by Jeremy Renner’s turn here too. He’s new to the David O. Russell stable, but his role was interesting and deep. Indeed, it’s this level of “deepness” that makes American Hustle as interesting as it is. It’s not some ham-fisted attempt at a con film, as each character has flaws and dilemmas. It’s not Oceans Eleven. Thankfully. The plot continues to thrust forwards, leaving you wondering just who is going to come out on top. I like the fact that films don’t necessarily end happily nowadays, as this introduces a lot of guesswork on the audience’s behalf as they try and second-guess where the film’s ultimately going to end up. Having said all of this, the film isn’t perfect. It’s got a meaty run time, that perhaps almost outstretched its welcome. Considering I’m a fan of all people involved in the movie, that says something. Quite what I’m trying to say? I’m not sure; it’s just that there’s fat that could otherwise have been trimmed here. Even just a swift 10-15 minutes hacked off the run time could have done wonders. That’s not to say it makes the film back… it just stops it being a “classic”. American Hustle is a wonderfully vivid movie set against the backdrop of the 1970’s. David O. Russell contnues his directorial run to deliver a beautifully written and shot film, albeit with a little extra fat than was perhaps absolutely necessary. 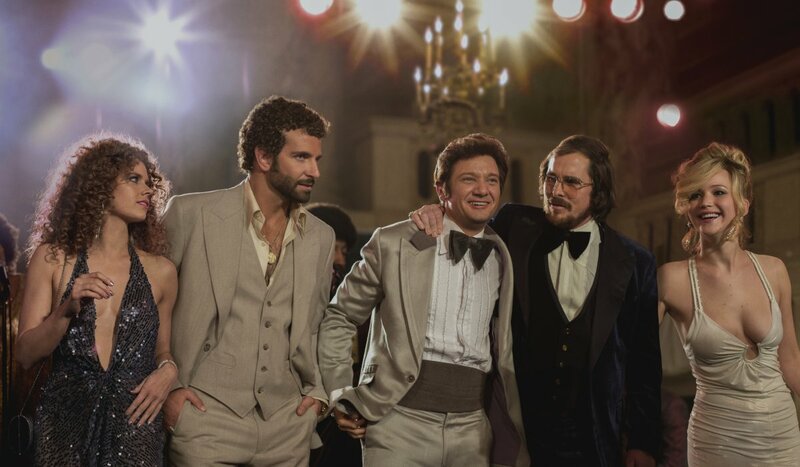 As awards’ season looms large, I wonder whether we could see any wins for American Hustle; it’s certainly a great film, but in a year with so many enormously strong contenders, can it walk away with any of the big ones? Time will tell. All of this just makes me interested to see what David O. Russell will deliver next, and who he’ll be using in his next ensemble piece. Although Nailed is cited as being his next production, it deviates somewhat from the more serious / likely to get acclaim films that he’s become synonymous with in recent years. We just want more Bradley Cooper, but who didn’t see that coming from us?! This entry was posted in Review and tagged 1970's, American Hustle, Amy Adams, Awards, BAFTA, Bradley Cooper, Christian Bale, cleavage, David O Russell, gangster, Golden Globes, Jennifer Lawrence, Jeremy Renner, Oscar, perm, Robert De Niro, Silver Linings Playbook, The Fighter. Bookmark the permalink. Such a fun cast to watch that, if there were any problems to be found here, I didn’t care too much about them because I was just having too much of a ball. Good review. I think Bradley Cooper is really underrated. He’s had some great roles and I always enjoy his performances. I saw this yesterday evening (Sunday 12th), and thoroughly enjoyed it. I think your review is spot on with it being a bit flabby in places and could easily have been trimmed a little bit and it would not have made any impact on the story! I loved the fact that all of the characters had some pretty major flaws in their characters! It certainly made for some interesting moments and laugh out loud bits too! Great review! I was a bit disappointed to see that all of those Oscar nominations didn’t result in a single award for Hustle. Plus, I agree that it’s pretty cool that Russell isn’t shy to pick favourites — it works well for everyone involved! I am a big fan of Bradley Cooper too. If you haven’t seen The Words yet, you should check it out. It’s one of his lesser known (and more amazing) roles.